The 108 leather saddlebags are designed with a short deluxe slight angle made to work with high pipes. It comes standard with a box top lid and quick release clips behind the roller bar buckles. The 108 leather saddlebags are customizable. They can be made zipper detachable with the yoke under the seat or bolt on with Easy Brackets or direct bolt on kits. 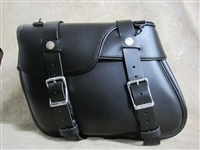 Leatherworks handcrafted, functional bag with full guarantee. Premium, Heavy Leather. Heavy Duty Hardware. Stress Points Hand Riveted. Box Top Lid Angle Bag. Short Deluxe Angle Bag. 10 ½" x 13" x 7"
Warranted Against Defects in Workmanship. The 112 leather saddlebags are designed with a wide angle slant saddlebag, box top lid and long straps. They are designed to follow the contour of the exterior shock. The 112 leather saddlebags are customizable. They can be made zipper detachable with the yoke under the seat or bolt on with Easy Brackets or direct bolt on kits. 12" x 14" x 7"
The 112P leather saddlebags are designed with a deluxe wide angle to follow the contour of the exterior shock. Rear pockets were added to our popular 112 leather saddlebags for 2″ of additional storage. They come standard with a box top lid and long straps. The 112P leather saddlebags are customizable. They can be made zipper detachable with the yoke under the seat or bolt on with Easy Brackets or direct bolt on kits. 12" x 17" x 7"
The 128 leather saddlebags are designed with a deluxe wide angle leather to follow the contour of the exterior shock. They come standard with a split lid and long straps. 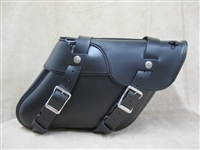 The 128 leather saddlebags are customizable. They can be made zipper detachable with the yoke under the seat or bolt on with Easy Brackets or direct bolt on kits. 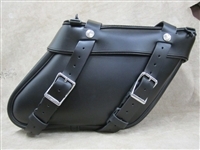 12" x 16" x 7"
The 120 leather saddlebags are designed with a special slight angle, split lid and long straps. The 120 leather saddlebags are customizable. They can be made zipper detachable with the yoke under the seat or bolt on with Easy Brackets or direct bolt on kits. 13 ½" x 18" x 7"